We are looking for BOTH young performers (ages 6-12) and teenagers (ages 13-18) to star in this production. This adaptation stays true to the original production and there are LOTS of amazing roles available for all ages! Lindsay Maron, dir.-choreo. ; Ben Boecker, music dir. -Rehearses weekdays July 23-Aug. 3 (10 a.m.-4 p.m.; performs August 3-5 at UCPAC’s Main Stage Theatre, Rahway, NJ. 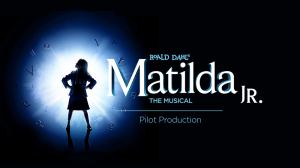 -Children to play the roles of Matilda, Bruce, Lavender, Amanda, Nigel, Hortensia, Eric, Tommy, etc. -Teenagers to play the roles of Miss Trunchbull, Miss Honey, Mr. Wormwood, Mrs. Wormwood, Mrs. Phelps, Acrobat, Escapologist, etc. NOTE: If you are unavailable to attend auditions in person, you are welcome to submit a video audition to info@pixiedustplayers.org (including a link to a video of your performance and your completed audition form) by Tuesday, June 12 at 8:00pm. This would be such a blessing to be able to show the world how dedicated I am to acting. I have always loved to be in plays because I love to show my strong emotions through ‘someone else’.